I assume you are using Arduino UNO. Pi's digital logic is at 3.3 V and that of Arduino Uno is at 5 V. Anyway to send data from Pi to UNO, you can connect the pins directly. UNO can recognise both the logic levels of Pi's output. But to receive data from UNO to Pi, make sure you build a voltage divider using resistors, that brings 5V output from UNO's pin to 3.3 V. Also the grounds of both Pi and UNO should be connected to each other. What you are asking really makes no sense at all. You are starting from the mid-point of your project and wondering how to communicate using bare GPIOs without really knowing what it is you want to communicate and what you want to do with that data - or at least you haven't made any of that clear to us. It is unclear what you want to do with the shield from the Pi. Do you want to control the relays on it by sending instructions from the Pi? Do you want the Pi to send and receive data through the XBee? Either way the Arduino is pretty redundant in the system and in fact gets in the way more than is useful. If it's just relays you want then it would be far simpler to wire cheap relay modules direct to the GPIOs of the Pi - then you don't have to worry about "how to communicate" - you just turn the relays on and off. If you want to communicate with the XBee there are far simpler shields available that will plug directly into a Pi. 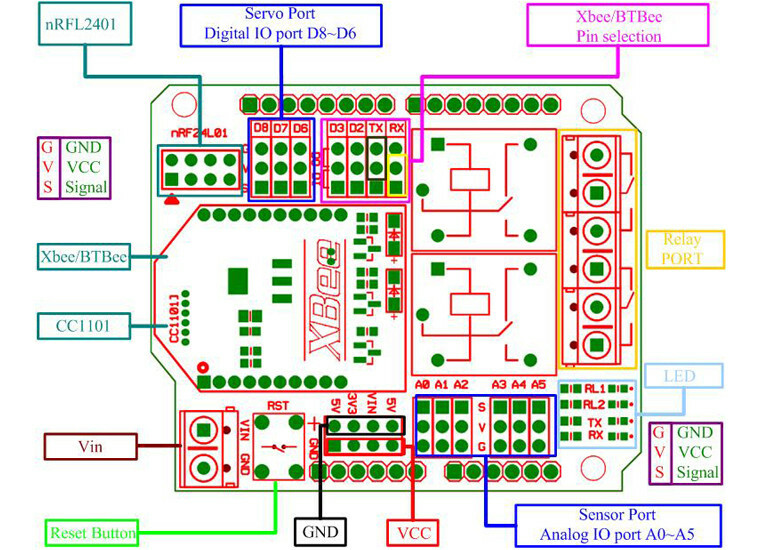 Indeed, there are some good shields around for the Pi ("Hats" I think they call them) which give you an Arduino footprint and an XBee socket together. The Arduino is completely pointless in this system. And anyway, if you wanted to make the two systems communicate there are far easier ways than with bare GPIO pins. Serial, for a start. The simplest ever method is to just plug the Arduino into the Pi's USB. That way it gets power and data all in one go. Just like using it with a computer. Not the answer you're looking for? Browse other questions tagged arduino-ide pins relay raspberrypi or ask your own question.